1) Appointments for new patients can only be made after we have received a faxed referral from one of your doctors. If you would like to be seen by the Kitchener Urology Partners, please contact your family physician (or one of your specialist physicians) to make a referral. 2) You may phone to request a follow-up appointment or a review if you have been previously been seen within the past year. Patients who have not been seen for more than 1 year require a new referral. 3) We require at least 24 hours notice if you will be unable to keep your appointment. If you are unable to keep your appointment and you do not notify the office, you will be billed for the missed appointment. 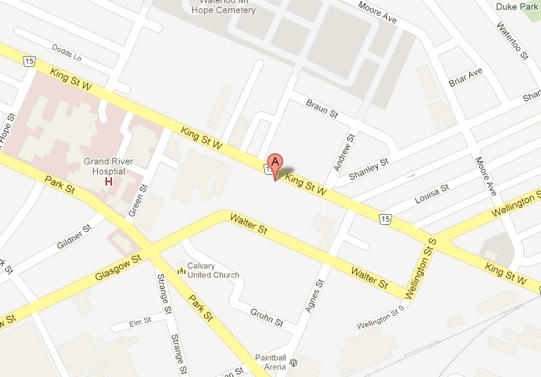 We are centrally located at 751 King Street West, suite 313 in Kitchener. We are across from the Central Meat Market. This building has paid parking at a cost of $4, payable upon exit.